What does a “northern light” do in the snow? As a “northern light” that has moved to the south, high snow has rather been an exception. And above all, very unstable. Here it stays on top of the mountains for quite a long time and when we take the car, we arrive in the most beautiful winter wonderland within an hour. At 1414m, it is the highest mountain here in the Black Forest and in the whole of Baden-Württemberg. 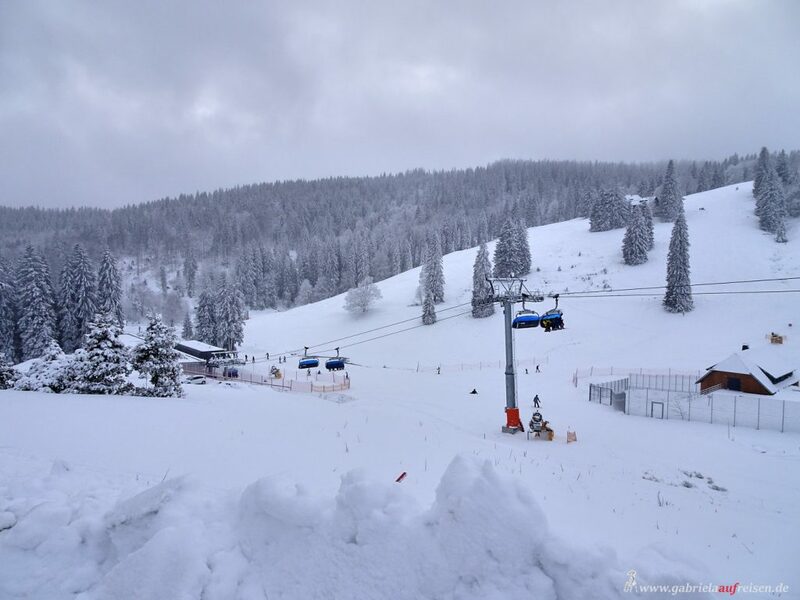 The lifts are in operation and there is a lot of activity on the ski slopes. 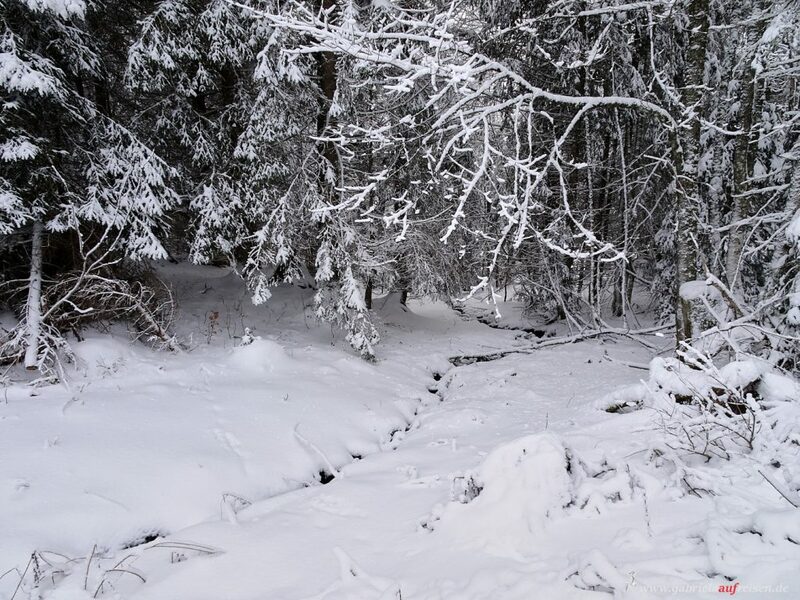 We are looking for a beautiful winter hiking trail and are happy that the sun is coming out more and more. 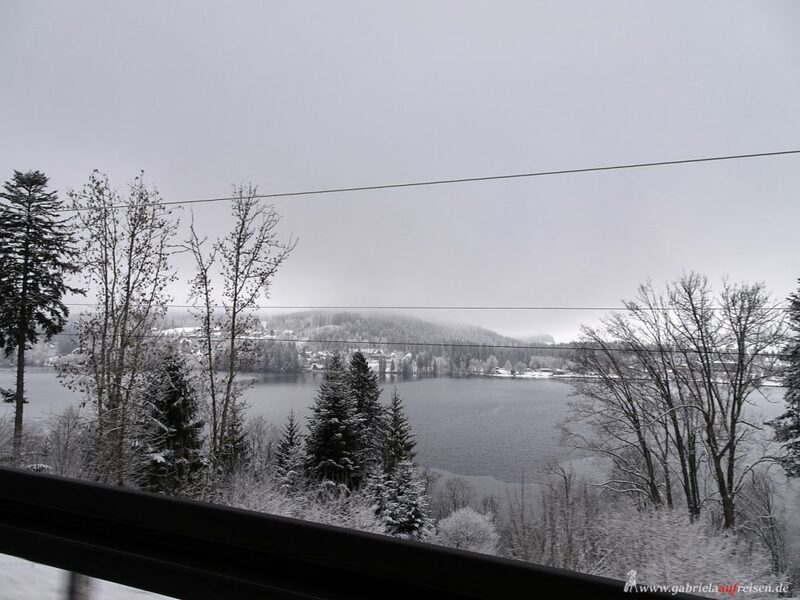 The snow glitters and again and again animal tracks interrupt the white splendor. A brook ripples and away from the slopes it is wonderfully quiet. From time to time a branch cracks or the shutter of my camera. The few people, like us on foot or sometimes with the sled in tow are greeting us all very friendly. In the Menzenschwander hut, which is located directly at the lifts, we make a stop. We even find a free table and have a coffee and freshly baked cakes. 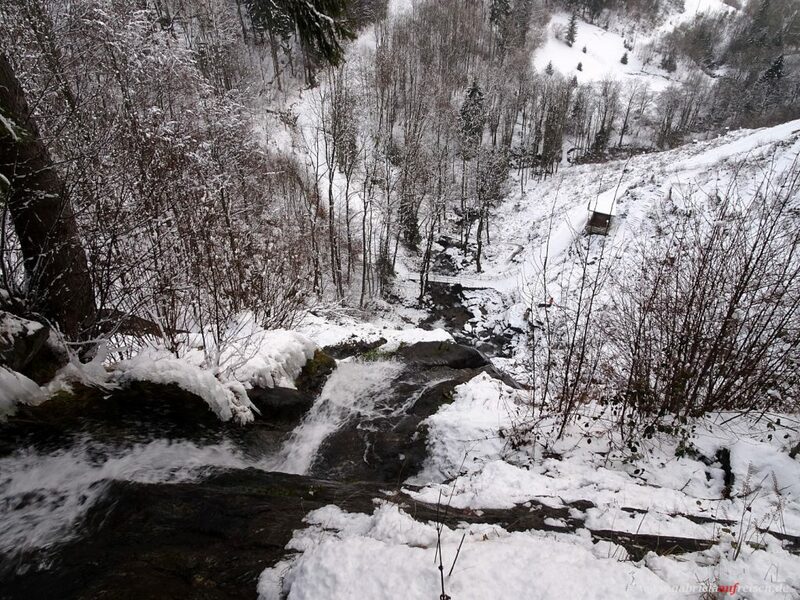 The path from the parking lot to the waterfall has been trodden on and can be walked on with winter shoes. 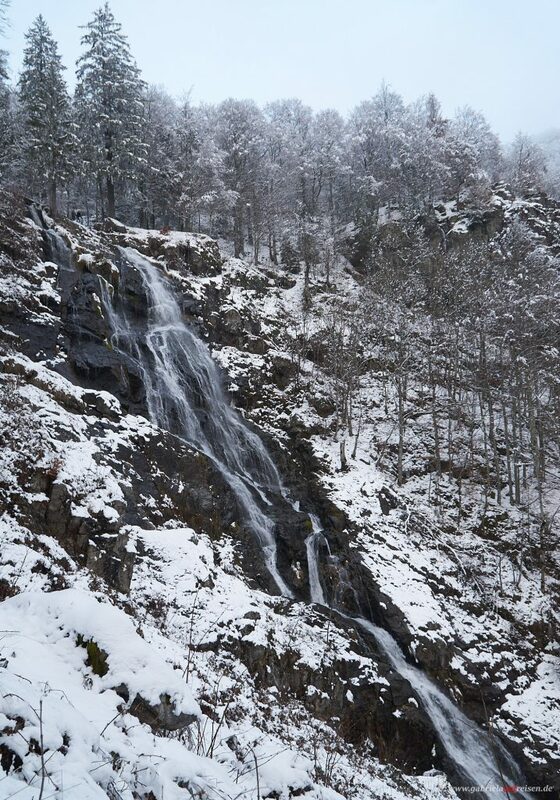 With 97 m, the waterfall is high and falls down five levels. 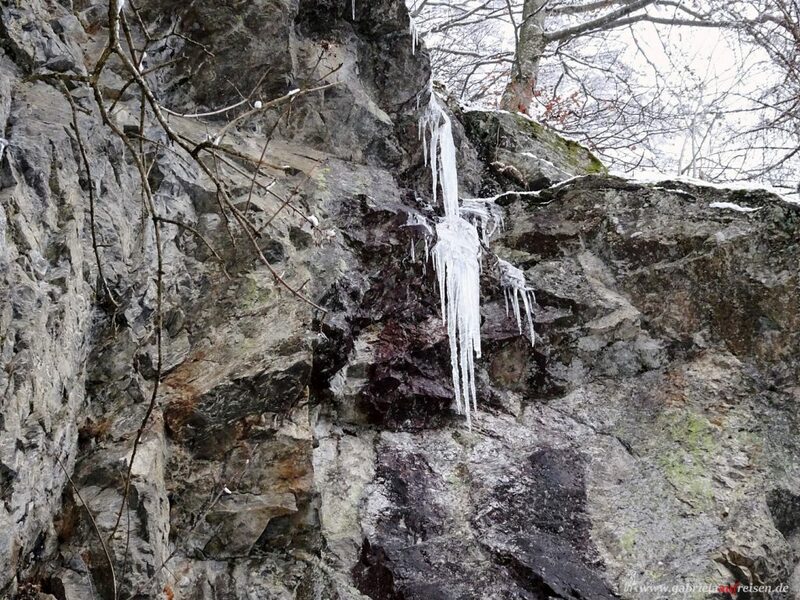 At the moment it does not have to much water, but already some icicles and of course snow. For my husband Dirk it is not enough to look at him from below, he also wants to go uphill. So we take the way up, which branches off on the left a few meters after crossing the small bridge . Here the tracks get less and you should be a firm walker. The stones and roots under the snow are not visible. Soon we are standing in front of steps that lead upwards. And here I am really glad that there is a railing. It goes pretty steep down the hill. Then we stand on the small bridge that spans the course of the waterfall and see that there is a small waterfall behind us. That is probably the first step. The spray of the water has formed small icicles everywhere and quickly on our glasses we get a water curtain. We take some quick pictures, as it’s getting darker. The sun does not make it over the edge of the surrounding mountains and we still have to cautiously descend many slippery steps on the other side. Done! That was a nice trip and now it’s back home. Unfortunately, not all weekends are so nice in terms of the weather, so we sometimes have a comfortable weekend at home. 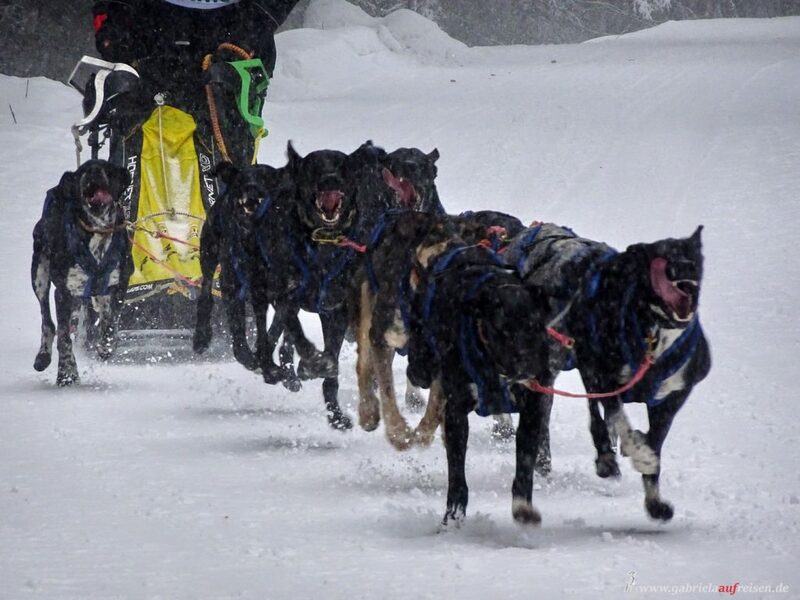 The whole weekend there are sled dog race competitions and we do not want to miss that. The place is well prepared. Everywhere are designated parking spaces and with a shuttle bus, the spectators are brought to the vicinity of the venue, or to the start and finish of the race. A decent slope is still to complete on foot. However, handicapped people can be brought to the starting point by minibus. What a good and competent organization! We are very early and can secure a good place just behind the starting point. 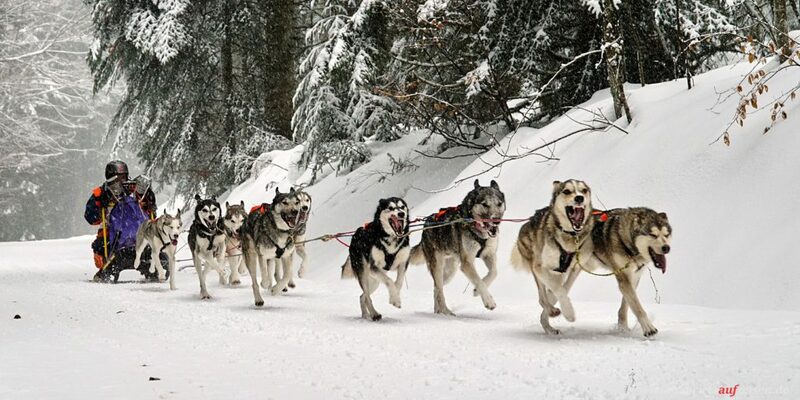 Everywhere we hear excited dogs barking in their car trailers, who can not wait to get tensed to finally run. Now and then it stinks terrible, well, what has to get out, must get out. Of course, this also applies to the dogs. However, their owners see that the legacies are removed as quickly as possible from the visitor area. In the first break we get up and follow the trail for a good deal. No sooner are we and a few other people on the road, it starts to snow properly. 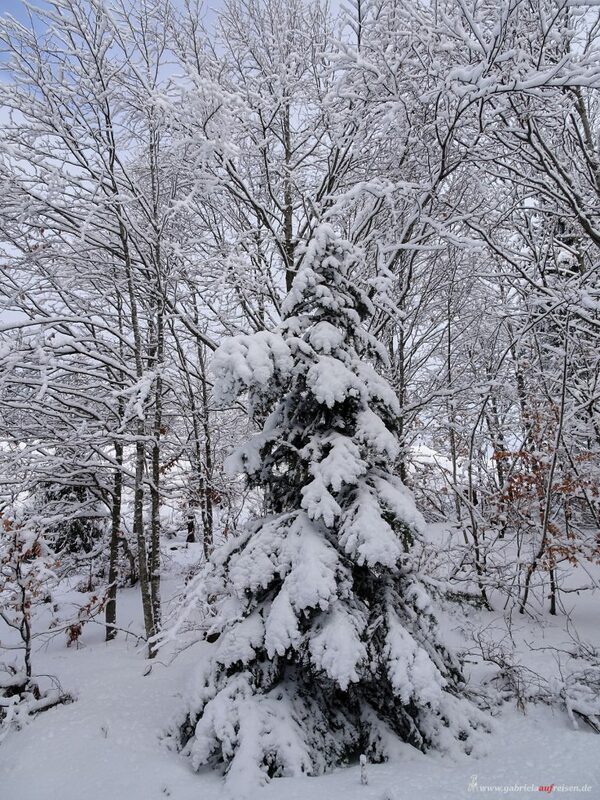 Actually, we wanted to shoot some great pictures, but in the snowdrift that will be difficult. There are fewer and fewer people going a bit further. Soon we are surrounded by absolute silence, only the snow is pouring without ceasing. We are looking for a sheltered place under a huge fir as we hear the barking of an excited crowd. Now the bigger teams are on it. We can hardly snap as fast as they pass us. Quickly I get rid of the snow on the camera and wait for the next team. Whether the teams are small or big, it is a great sight and a great atmosphere when the teams are cheered on. Sometimes they come from far, one even comes from Bremen. sure the dogs are happy to finally be able to run on a lot of snow. In the early afternoon we take the shuttle bus back to the village. Here they got a supporting program. 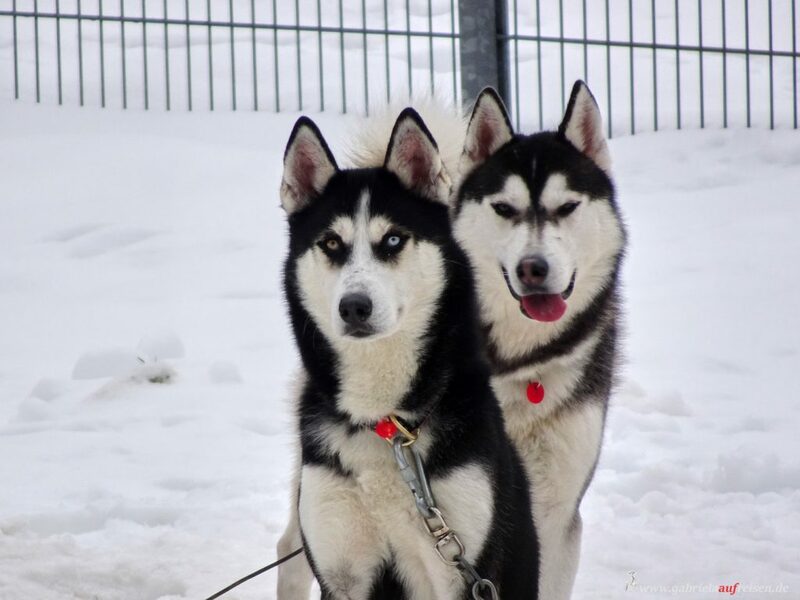 Stalls and music are set up and an area is fenced where interested people can get to know sled dogs and learn more about their attitude. Of course, this is great for children, who may come for the first time ever in the vicinity of such large, but also very friendly dogs. We have coffee thirst and try Café Zimmermann. Coffee and cake are really excellent, even if I feel a bit set back in time in the restaurant. So strengthened we drive back. On the way we spontaneously decide to go sledding a bit, because we pass a toboggan run shortly after Todtmoos. Good that Dirk thought of the sled. 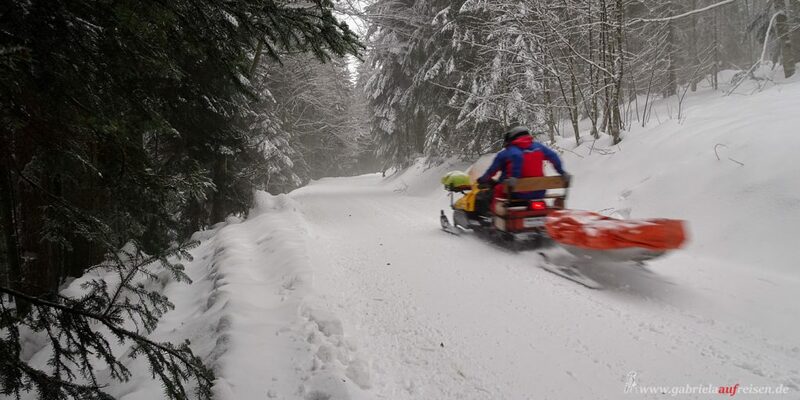 This is fun, but pulling up the sled is exhausting, so a 100 m track is something else than the little hills that I knew so far. 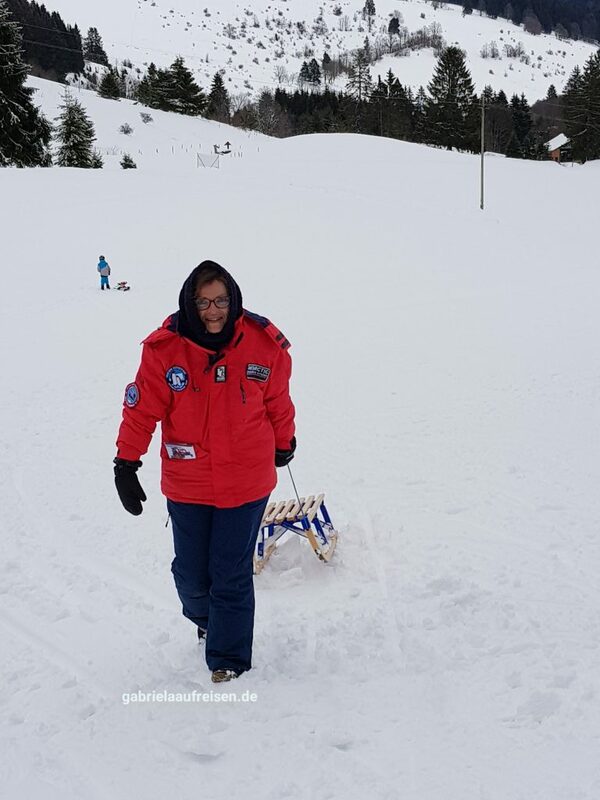 uphill with the sled, what an exercise! 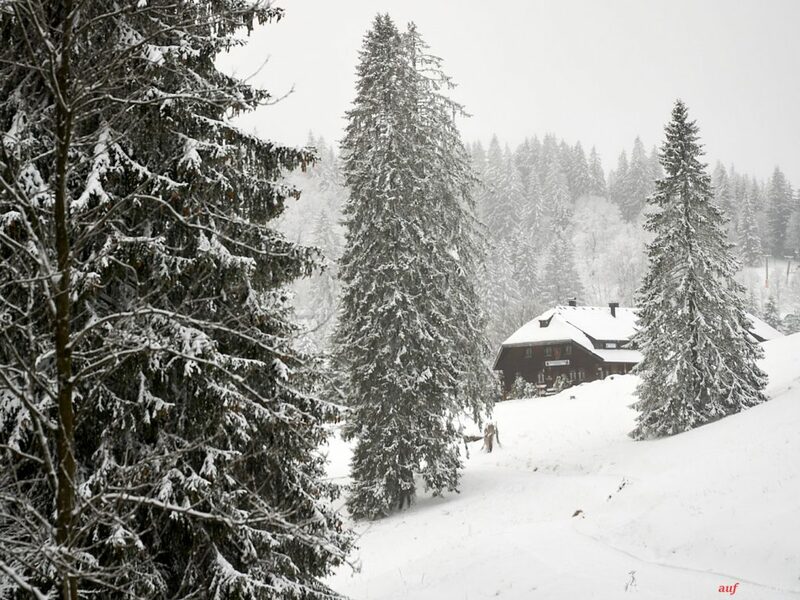 For today it is enough, the next snow weekend is coming! I appreciate your comments and, of course, especially if you follow my blog or on Instagram, Pinterest, Facebook or Vero. My good friend Wolfgang has just moved back to his home town of Freiburg, so I am sure he has seen these sights and is probably a bit tired of the cold weather there, having lived in California for many years. Still I will share your photos with him. I’m sure he will enjoy them as I did! oh, he moved back from the ever shining sun? I hope, he got a good reason to do so ;-), but Freiburg is a really nice city. You should come and look for yourself!